The SAINT-sRNA transfection reagent is a proprietary, non-toxic formulation of fully synthetic cationic and neutral lipids that forms positively charged complexes with small RNA, such as siRNA and miRNA mimics or inhibitors, and enables highly efficient delivery of small RNA into a variety of mammalian cell lines. 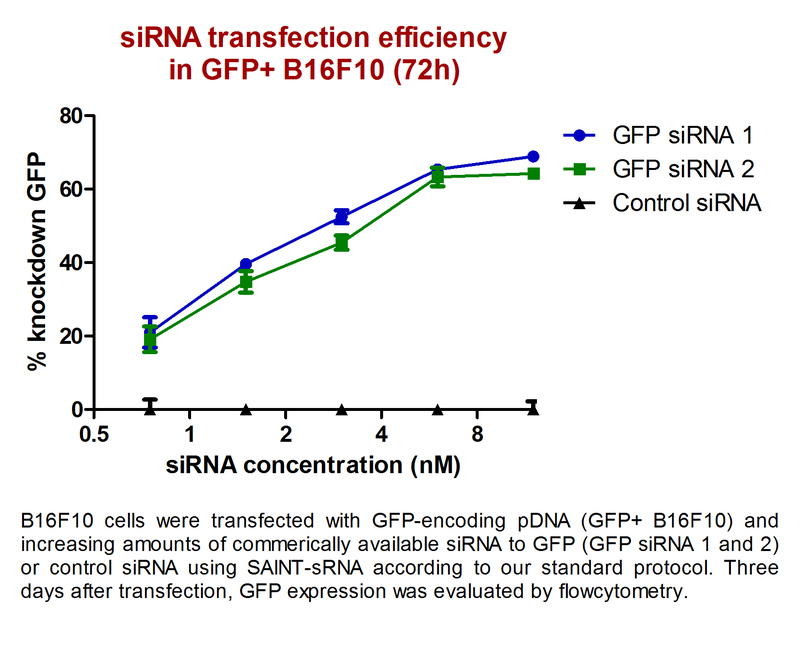 Minimal amounts of siRNA are required for efficient down regulation of the target gene. The transfection procedure using SAINT-sRNA is easy: just mix the reagent with your siRNA or miRNA, incubate and pipette the complexes onto your cells. SAINT-sRNA transfection reagent (1 ml) is sufficient for up to 200 transfections in 24-well plates or up to 1000 transfections in 96-well plates. SAINT-sRNA, stored at 4°-7°C, is stable for at least one year after opening. 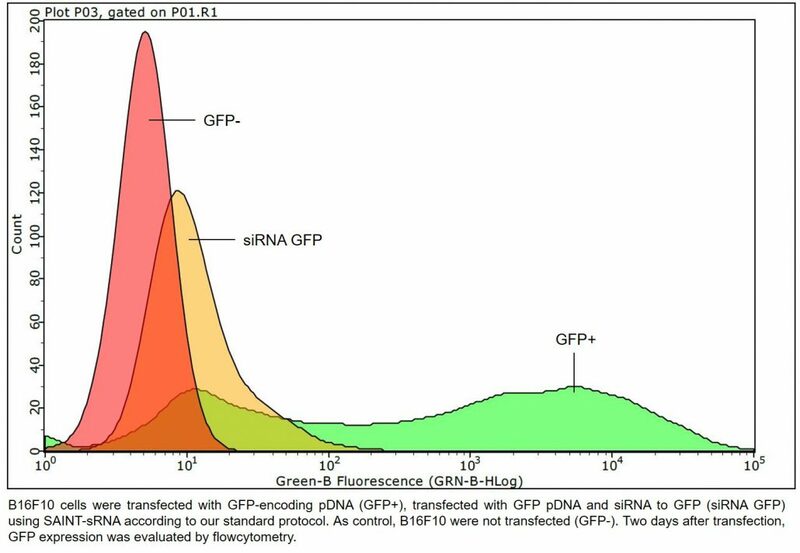 SAINT-sRNA is an improved version of SAINT-RED for transfection of small RNA’s, which has been used successfully in many studies (see below for examples). For a more complete overview of the cell types successfully transfected with SAINT-sRNA, please visit our cell line database. Krausz E, et al. “High-content siRNA screening.” Molecular BioSystems 3.4 (2007): 232-240. Xu H, et al. “Protein kinase C α promotes angiogenic activity of human endothelial cells via induction of vascular endothelial growth factor.”Cardiovascular research 78.2 (2008): 349-355. Roeven M, et al. “Efficient nontoxic delivery of PD-L1 and PD-L2 siRNA into dendritic cell vaccines using the cationic lipid SAINT-18.” Journal of Immunotherapy 38.4 (2015): 145-154. Zibrova D, et al. ”GFAT1 phosphorylation by AMPK promotes VEGF-induced angiogenesis.” Biochem J 474 (2017): 938-1001. The general SAINT-sRNA protocol is suitable for many experimental conditions. However, since siRNA are extremely susceptible to degradation by RNAses present in serum, an Alternative Serum-Free siRNA Transfection Protocol using SAINT-sRNA is available. Which protocol will be best for your research goal is highly dependent on the experimental conditions (e.g. cell type, cell conditions, siRNA quality and stability). One of our customers compared both protocols for siRNA transfection in HUVEC and showed that the Alternative Serum-Free siRNA Transfection Protocol worked best in their experimental conditions.